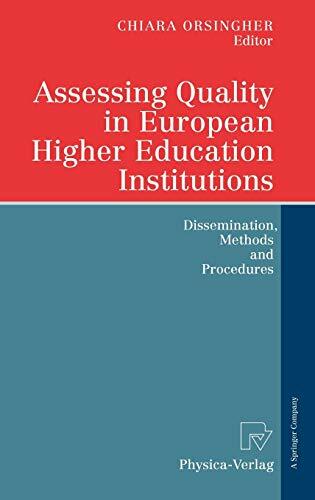 [PDF] Assessing Quality in European Higher Education Institutions: Dissemination, Methods and Procedures | Free eBooks Download - EBOOKEE! Description: European higher education institutions are facing in these last years a number of relevant political and social changes that have asked for more transparency, accountability, comparability and legitimacy of degrees. In light of these new challenges, the great majority of universities have responded by implementing quality assurance processes, either through evaluation or through accreditation. This book collects the evaluation and accreditation experiences gathered by higher education institutions in Finland, France, Germany, Italy, the Netherlands, Portugal, the United Kingdom and Sweden. It provides a synthetic picture of the present state of quality assurance practices in Europe and offers a few lessons for a future European dimension of quality assurance. No comments for "[PDF] Assessing Quality in European Higher Education Institutions: Dissemination, Methods and Procedures".